Creamy Asiago Cheese Tortellini – tortellini smothered in a creamy Asiago cheese sauce. Easy and quick – the whole recipe takes only 30 minutes from start to finish! A perfect and easy pasta dish – easy enough to make on a regular weeknight, but it tastes like pasta from a fancy Italian restaurant. Asiago cheese is very flavorful and perfect for cheese tortellini. And, garlic makes everything better! 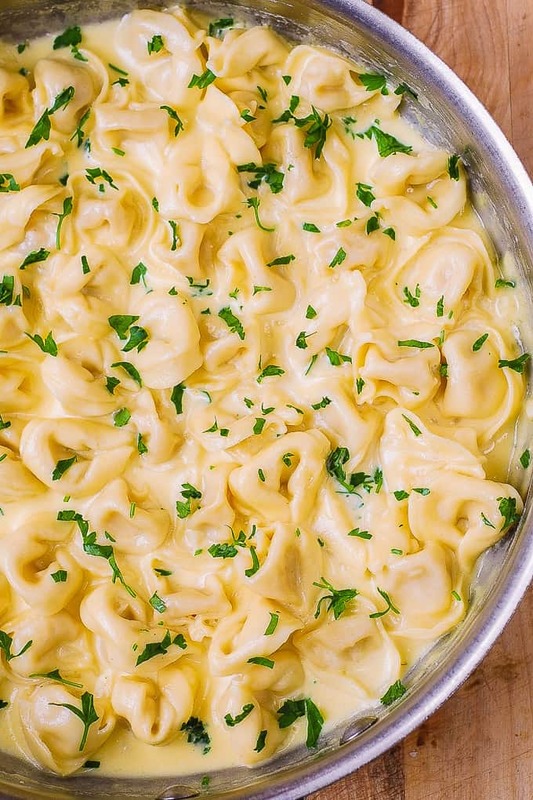 I like to use (and highly recommend) the refrigerated kind of tortellini. For this recipe, I bought a 20 oz bag of tortellini, and used 1/2 of the bag – which equaled to 2 and 1/2 cups of uncooked tortellini. How to reheat leftovers. 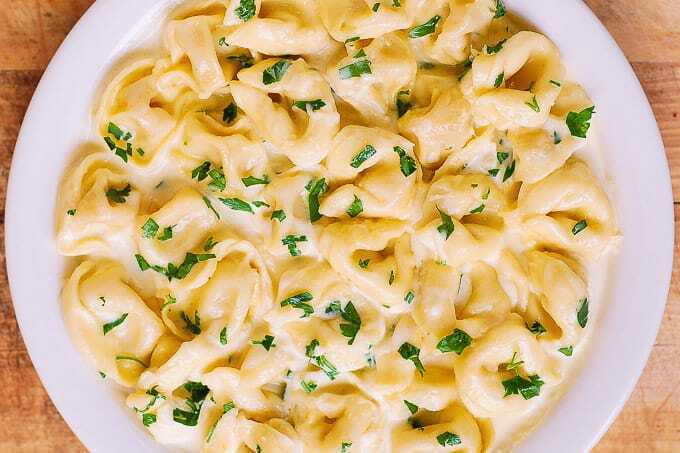 While any creamy cheese-based sauce is best served immediately after making it, you can easily reheat leftover cheese tortellini with Asiago cream sauce by adding a small amount of milk as you reheat the sauce on the stove top. How to fix lumpy sauce. If the cheese in the sauce lumps – increase the heat and keep stirring at all times, until the lumps melt. If sauce gets too thick, add more broth to thin it out. Cook cheese tortellini according to package instructions. 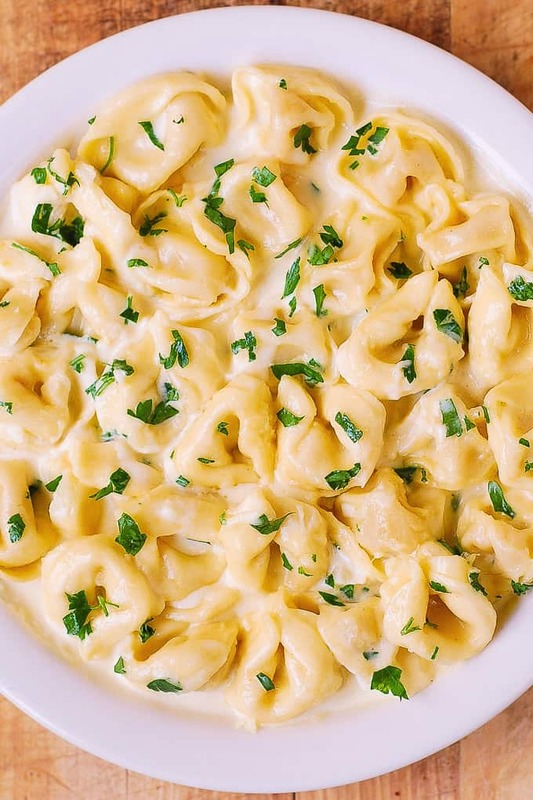 Make sauce of your choice to go with tortellini, such as creamy Asiago cheese sauce. Heat olive oil and butter on medium heat in a large skillet. Add minced garlic and cook for about 1 minute on medium heat, stirring, without burning. Add vegetarian broth and heavy cream to the skillet with cooked garlic. Once the liquids are boiling, immediately add cheese, reduce heat to medium simmer, and keep stirring everything together, on medium simmer, until cheese melts – about 1 minute. Reduce heat to very low simmer. 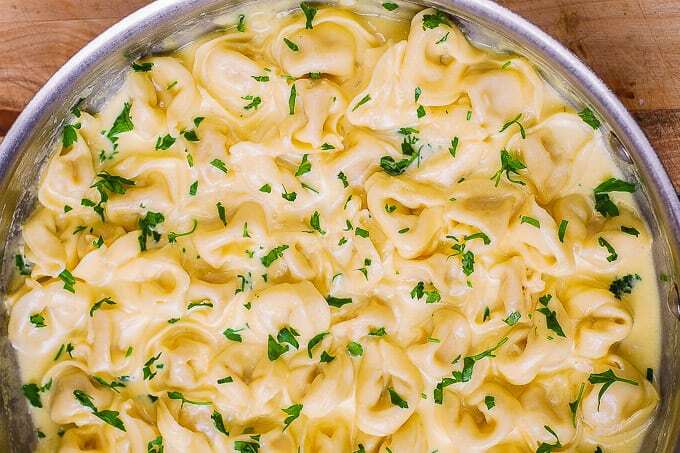 Creamy Asiago Cheese Tortellini - tortellini smothered in a creamy Asiago cheese sauce, the recipe takes only 30 minutes from start to finish! Delicious, meatless pasta recipe. Perfect as is, or as a side dish to grilled meats. Cook tortellini according to package instructions, rinse with cold water and drain. Heat olive oil and butter on medium heat in a large skillet, add minced garlic and cook for about 1 minute on medium heat, stirring, without burning. Add vegetarian broth and heavy cream to the skillet with cooked garlic. Bring to boil, stirring. Once the liquids are boiling, immediately add cheese, reduce heat to medium simmer, and keep stirring everything together, on medium simmer, until cheese melts - about 1 minute. Note: If the cheese lumps - increase heat and keep stirring at all times, until it melts. Reduce to very low simmer, add salt. I usually add 1/8 teaspoon of salt, taste the sauce, and then add another 1/8 teaspoon of salt if needed. (Do not add all of 1/4 teaspoon of salt right away - taste first). If sauce is too thick, add more broth to thin it out. Add cooked tortellini, and continue to cook, constantly stirring, to thicken the sauce - for another minute. This was soooooooo ridiculously yummy! Even the picky people in my house loved it! I used a little less garlic but this has the most perfect sauce. So happy to read comments like yours! I am glad you enjoyed the sauce! Made this recipe last night for my friends, and the taste was perfect. Great recipe, Yummy and Delicious! Will make it again. Can chicken or sausage be added to it? Yes, cooked or grilled chicken, or crumbled cooked sausage will taste great in this recipe. I had absolutely no problem with clumping after following the directions, super easy except for it doesn’t say how long to simmer before adding the pasta. Delis, will have it again! Does it have to be the refrigerated kind of tortellini? Would the kind you keep in dry storage work as well? Any kind of tortellini would work. I had no problems with clumping but the Asiago cheese was way too strong for my family. I added andouille sausage which complemented it wonderfully. I might make it again but use parmesan cheese instead and maybe a bit less cheese. Absolutely delicious sauce, but I had the same problem with clumping. I did have the liquid boiling before adding the cheese and it was mixing well until I lowered the temp. I used a block of asiago, which I grated myself. Next time, I’ll try it with a commercially grated cheese as they have a flour coating, which would also help thicken the sauce a bit, and if that fails, I’ll try a powdered cheese (like the cans of Parmesan), because this sauce has amazing flavor! If it clumped when you lowered the temperature, raise the temperature again (to boiling point), add more heavy cream or chicken or vegetable broth to thin the sauce, and keep stirring (while on high temperature) until the clump melts.